Part pseudo-documentary, part sci-fi action movie, District 9 is full of excellent moments that seem to transcend both of these genres. We’ve seen the basic themes before: humans don’t get along with each other (or aliens), the government cannot be trusted, anybody who apparently sympathizes with disgusting aliens is a criminal, and often enough, wimpy losers become heroes whenever they are placed in epic, worlds-collide type situations. None of these cliches seems to knock the movie down, though. It is still popping with originality: the alien mother ship has “stalled out” over Johannesburg, and, as one of the “interviewees” says, “The whole world was watching, so we had to do the right thing”. The right thing being, of course, to invite the aliens down to stay for a while (it had been 20 years at the start of the film). The alien costumes and effects are spot-on and full of life, and the slum that s District 9 holds a mystique of gritty danger. I will say though that fifteen minutes or so into the film, I began to wonder if it was intended to be a farce. The lead character is so hapless, the concept of having the Prawns sign eviction notices is so humorous, and many of the comments from the neighborhood humans so absurd, that I started to smile in realization. But then the plot turned serious – our goofball protagonist is thrown into chaos and becomes a hero with a purpose. While I’m sure some of the humor is intended, I wonder if the transition into the action could have been smoother. With the pseudo-documentary, there is always an underlying tongue-in-cheek sensibility. To play to that feeling and then move in another direction is a little tough to swallow. The rest of the film is both fascinating and frustrating. The discovery that one of the Prawns is smart – heck, really smart – erased much of the flatness of the opening sequences. Suddenly we have possibilities – What have the Prawns really been up to for the last 20 years? What are they capable of? But the filmmakers decided not to go too far in that direction – Apparently our Prawn hero (dubbed “Christopher Johnson” by the humans) is the only alien with brains and a plan. We never learn where the Prawns came from or why they were near Earth in the first place. And that’s fine; we are far more interested in the escape. So the film turns into a tale of the Isolated Man (and his buddy, the Isolated Prawn? ), who becomes a pariah and struggles to return to his life before the insanity. Even though this leads into a handful of action movie cliches, these cliches are handled skillfully, and I was pleasantly engaged throughout the remainder of the picture. The ending is a nice touch: an open-ended, bitter-sweet finale that lends power to the wife subplot that had been only touched upon earlier. As a whole, I liked the movie and thought it flirted with excellence. But there is a constant confusion of style that keeps it in check; we the viewers are never allowed to fall completely into the story, being jolted awake by misplaced commentary and the attempt to hold an action movie inside a documentary. This entry was posted on February 7, 2010 by Ian Kay. 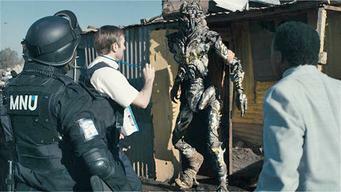 It was filed under District 9 (2009) .